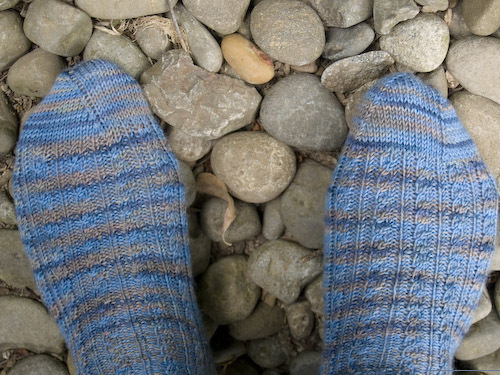 These are, of course, the Conwy socks from Knitting on the Road. My mother and I have actually been to Conwy (I was thirteen, and thought scrambling all over the crumbling castle was about the best thing ever) and blue is her favorite color, so I thought these would be perfect for her. I knit them on US #0 circs, so I had to adapt the pattern somewhat. In hindsight, I probably would have been fine with #1’s. The socks are a pretty snug fit, even on my narrow feet. But I like the way the Lorna’s Laces stripes so beautifully on #0’s – #1’s make it flash, in my experience, and this sort of tabby effect pleases me much more. 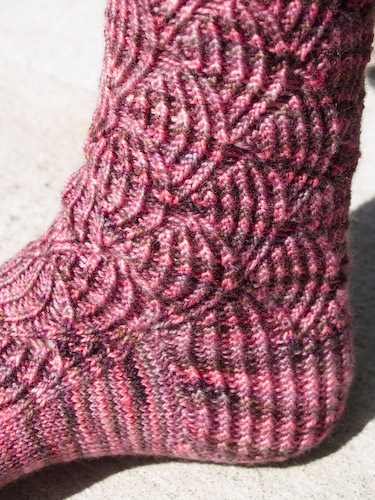 Love, love this Pomatomus sock. I made one little error in the last chart repetition before the toe – I swear there’s something a little goofy in the instructions – but you can’t really tell, and it’s the part that will be in my shoe anyway. Again, this yarn is fabulous Claudia Handpainted in “Plumlicious”, worked on #2’s as the pattern directs. I didn’t get row gauge, so I shortened the heel flap to avoid knitting a full-on toga for my heel, and I sort of freestyled the toe decreases. Other than that, I’m working Pomatomus exactly as directed. Time to cast on its mate! But first, back to the basement. My poor indentured parents shouldn’t slave alone, handknits or not. Tour de Fleece handspun, Part 1! I’ve made two spindles full like this. The folks at the local bike shop where I’m watching the Tour have probably never seen anyone spin and watch cycling at the same time. But they’re kind of digging it, I think. Our new neighbors manage the store and they’re awesome. Yay for awesome neighbors! spinning and spinning 🙂 they go together well! love all the socks! great colors and patterns both. miss you around here! Your Pomatomus looks great! I really struggled with these socks (I just finished a week or so ago and am slightly tramautized). I also think there’s something a little goofy with the instructions right before the toe. Luckily, especially if you’re using varigated yarn this pattern seems to hide even major mistakes (um, mine, not yours). Wow! Do you have a sock machine that just spits socks out? Seriously, girl. Great job on the handspun. I love the Conwys!! The tabby-like striping is very pleasing, I agree. And I can’t wait to make some Pomatomases! I need to find a great variegated solid like your Plumlicious… Hmmm, maybe I’ll grab some Claudia Handpainted too. And like Ms. Gleek says, we sure do miss you round these parts. 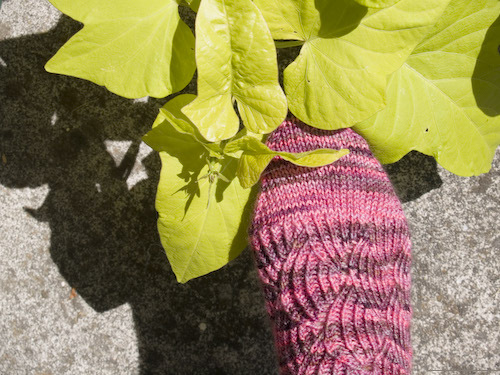 I love those Pomatomus socks – it’s such a great pattern and a wonderful yarn to do it in. 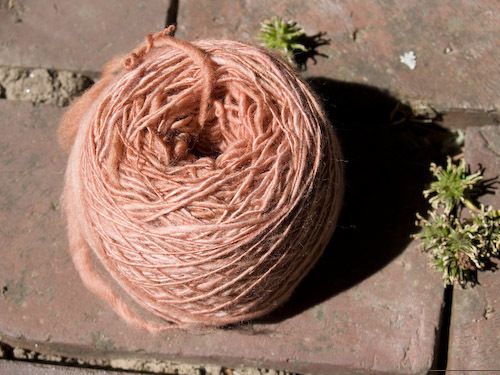 Look at that handspun – sweet – I can’t wait to see it plied! Great socks. 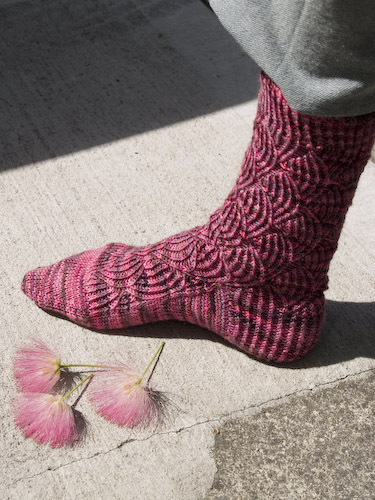 (I’d love to start a foray into sock knitting with those Pomatomus socks; they’re the only socks I’ve seen out there that have actually made me want to knit socks!) 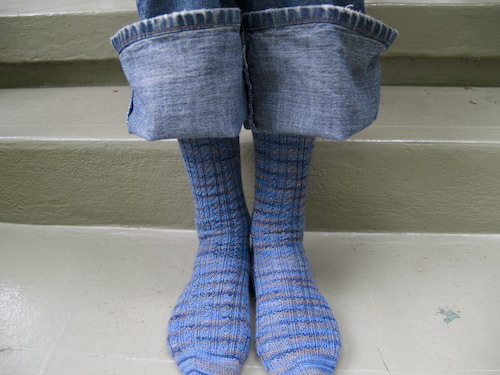 My favorite photo is the one with the reverse cuff jeans. You have got to put that up on the sidebar in the future. i did the pomotamus socks on 1’s. i don’t recall the pattern calling for 2’s, lol. and they fit my sockpal000za pal just right, lol.